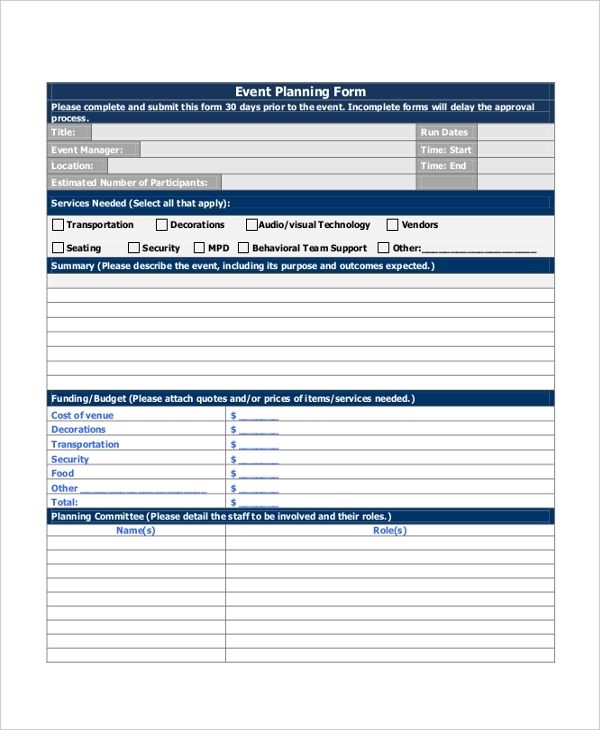 Event forms enable any organization to conduct events smoothly by providing the requirements to the event organizers. They help in conducting events without hassles and enable to plan various activities as well as allocate budget for the event. They enable to evaluate, assess and survey the events as well. 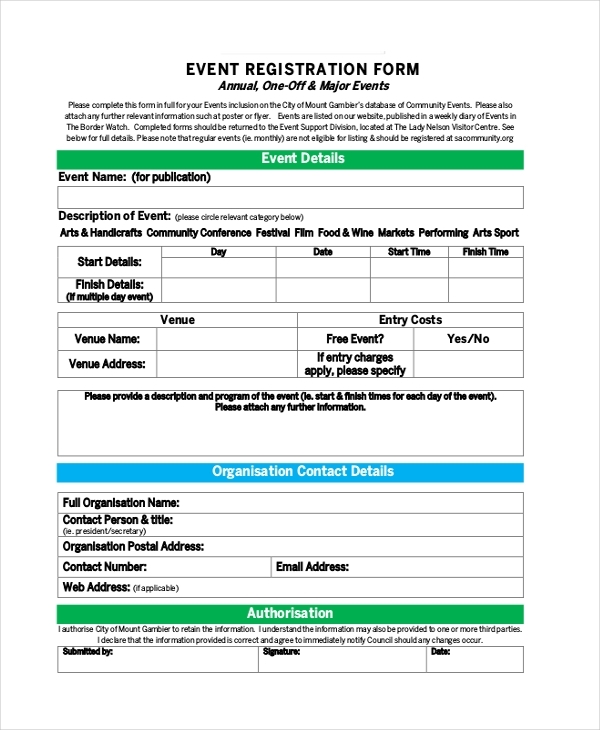 Free event registration forms can be utilized to book an event. 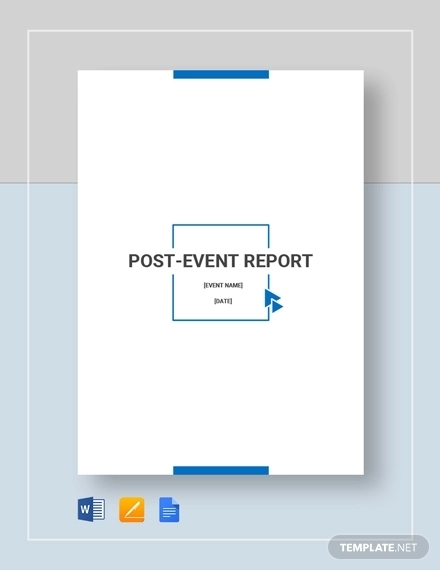 To report any incident one can utilize adverse event report form. One can search Google using event forms for event planning or from event attributes and know their details. 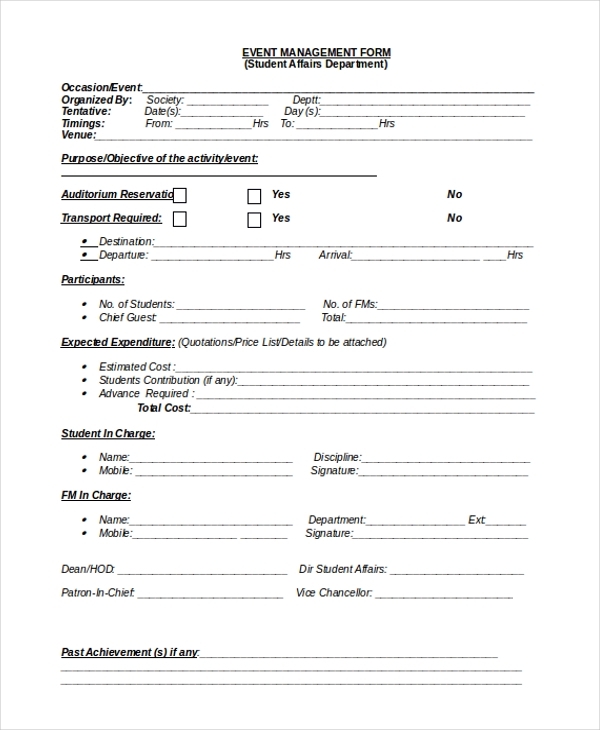 This event application form presents event details like event name, date and time of the event, expected attendance, activities planned and contact details like organization name, website, address, contact person and number. It also mentions about parking and catering services. 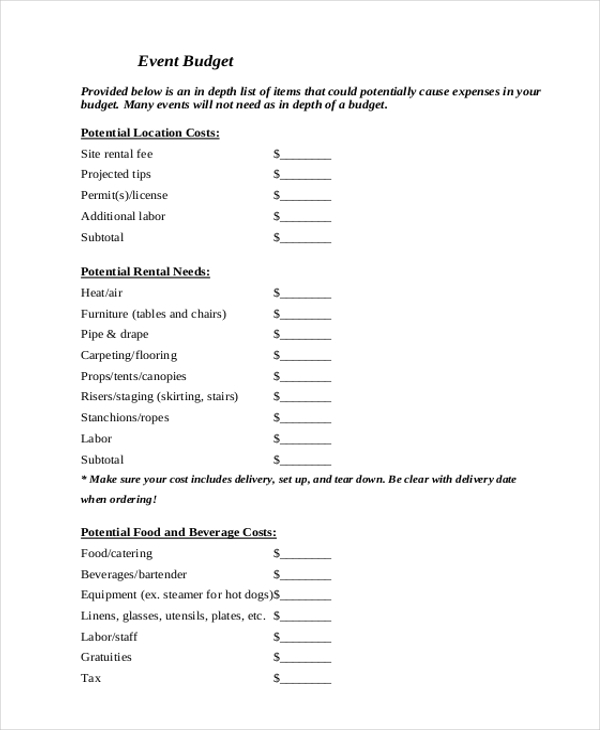 This event budget form presents potential location costs like site rental fee, projected tips, license fee, additional labor cost and potential rental needs like heat, furniture, drape, carpeting, tents, etc. as well as potential food and beverage costs like catering, beverages, equipment, utensils, labor, etc. 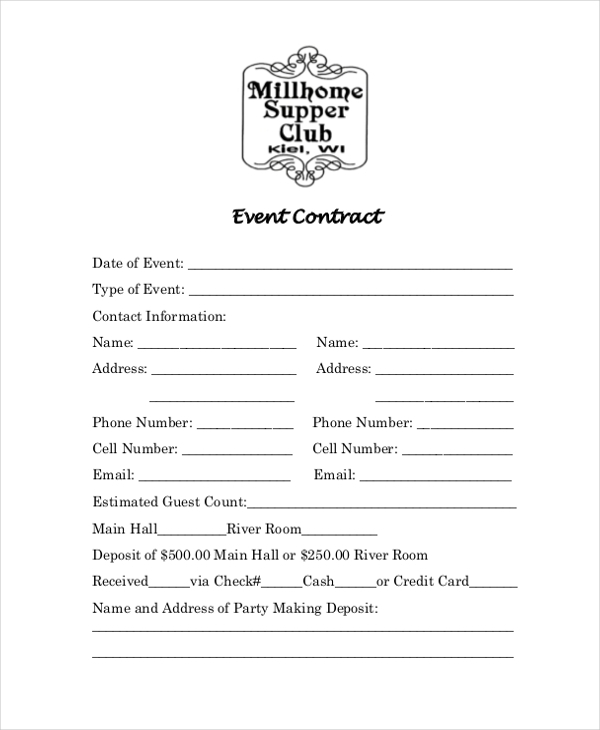 This event contract form presents date of event, type of event, contract information such as name, address, phone number, cell number, email id and approximate guest count, required room, deposit payment mode as well as name and address of the party paying the deposit. 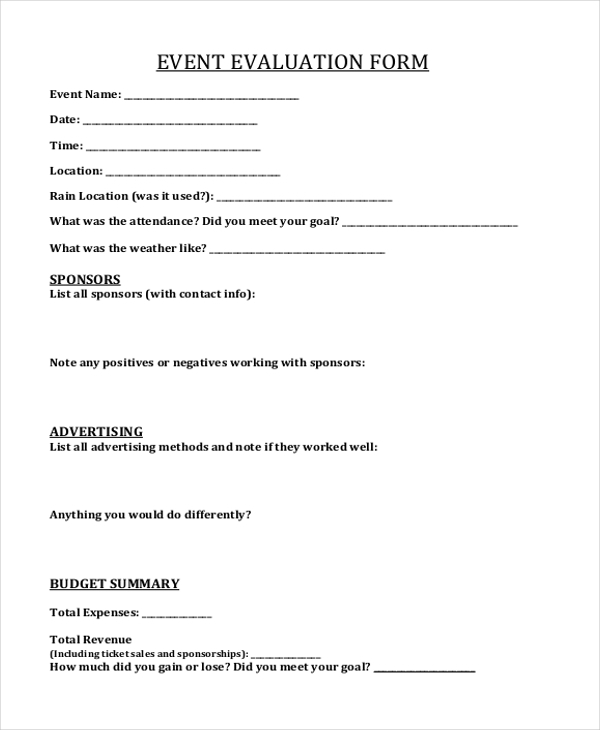 This event evaluation form presents event name, date, time, location, rain location, approximate attendance, weather information, list of sponsors, list of advertising methods, budget summary, incidents, general evaluation and feedback from the attendee. It also request to attach documents like survey, event agenda, etc. 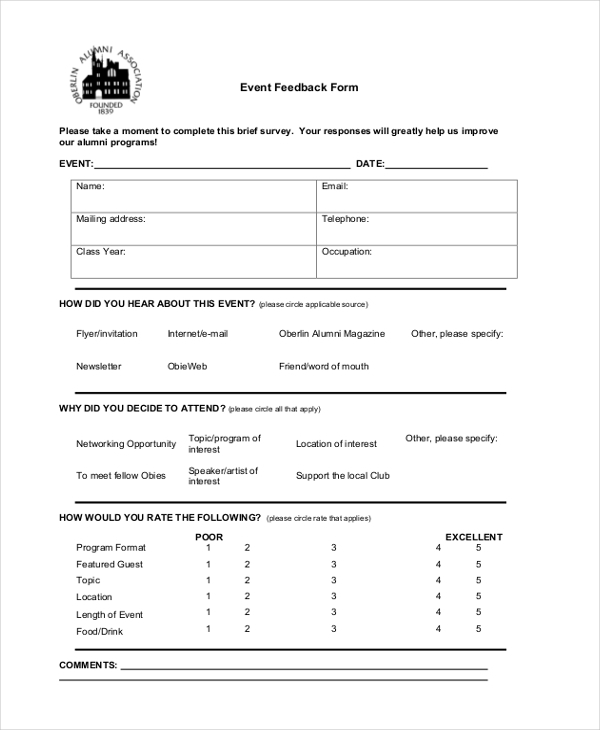 This event feedback form presents details like event name, date, contact name, mailing address, email id and occupation. It inquires details about the method of information the person got to attend the event like flyer, email, newsletter, etc. It also asks the reason to attend the event and obtains rating for the event. This event management form presents event name, organizer name, date and time of the event and venue details. It also presents objective of the event, reservation for auditorium required, transport required, number of participants including students, guests, etc. It mentions the estimated expenditure and additional requirements. 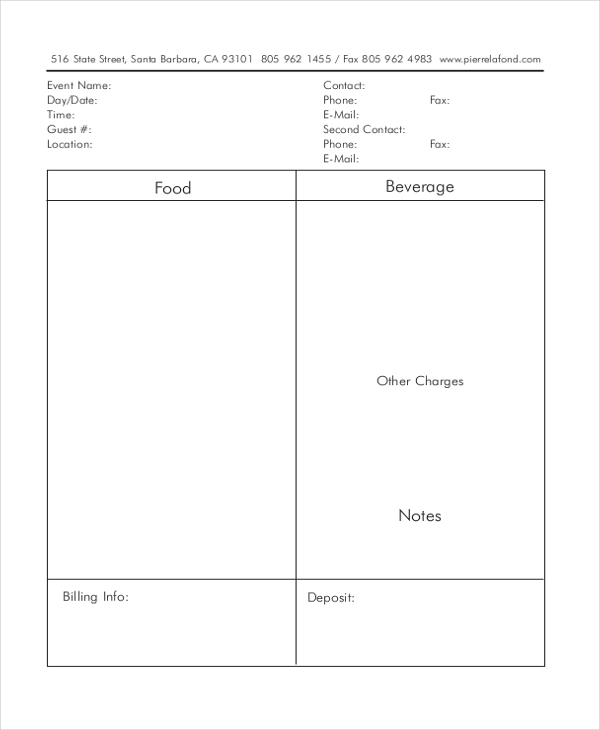 This event order form presents client information like company name, contact name, billing address, delivery information like delivery date, pick up date, delivery address and furniture details. It also mentions details of utensils, linen, floral, glassware and food service equipment. 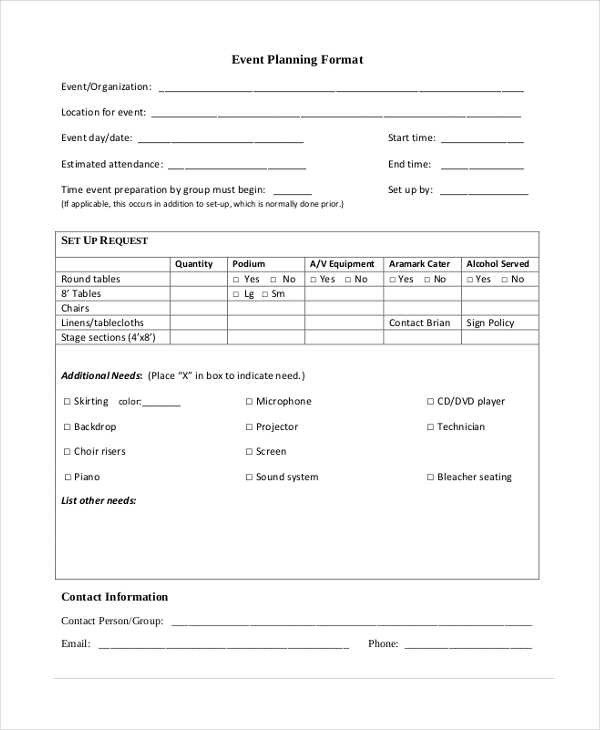 This event planning form presents event title, event manager, run dates, location, number of participants, services required, budget plan details, planning committee members, contingency plan details, project task information. It requests to complete and submit the form thirty days before the event. 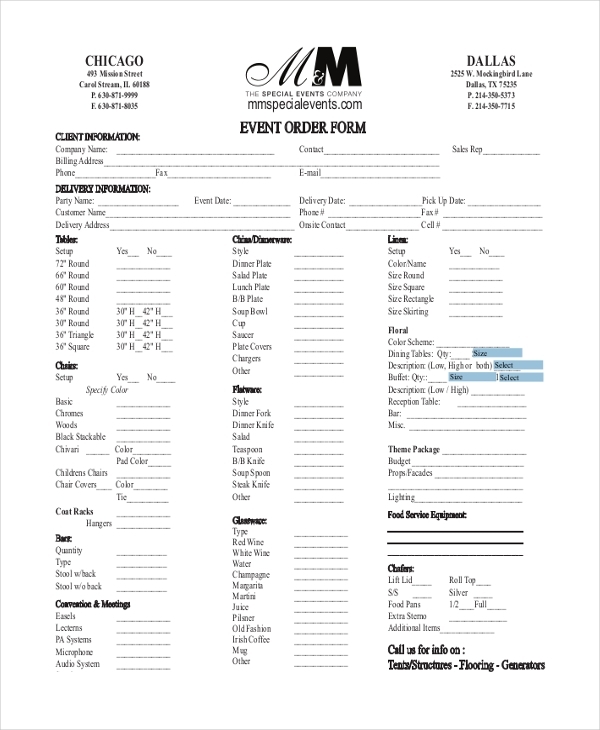 This event planner form presents details like event name, location, date, estimated attendance, start and end time as well as set up requirements like tables, chairs, linens, stage sections. It also mentions additional requirements like microphone, projector, technician, screen, sound system, piano and backdrop. 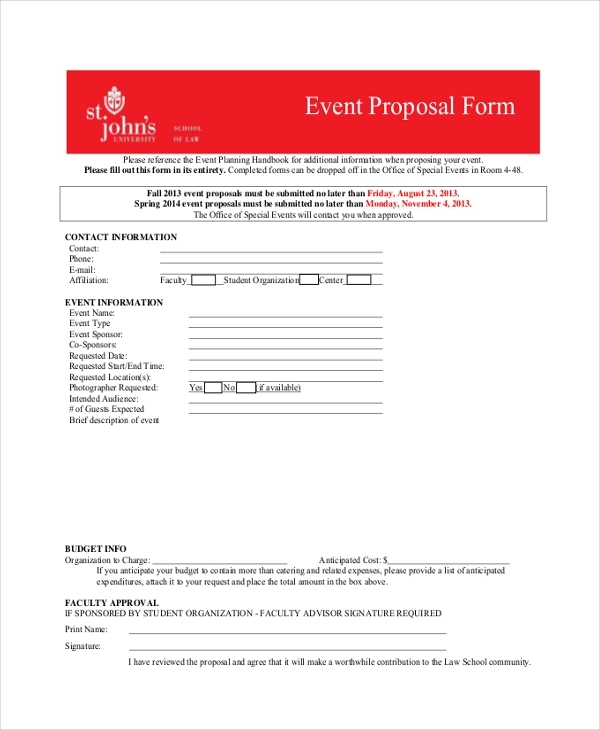 This event proposal form presents contact information such as contact person, phone, email id and affiliation. It also presents event information such as event name, type, sponsor, co-sponsors, requested date and time, location, number of audience and description of the event. This event registration form presents event name, description, venue details like address, entry costs and organization contact details like organization name, contact person, postal address, contact number, email and web address. It also obtains authorization for the above details and for confirmation. 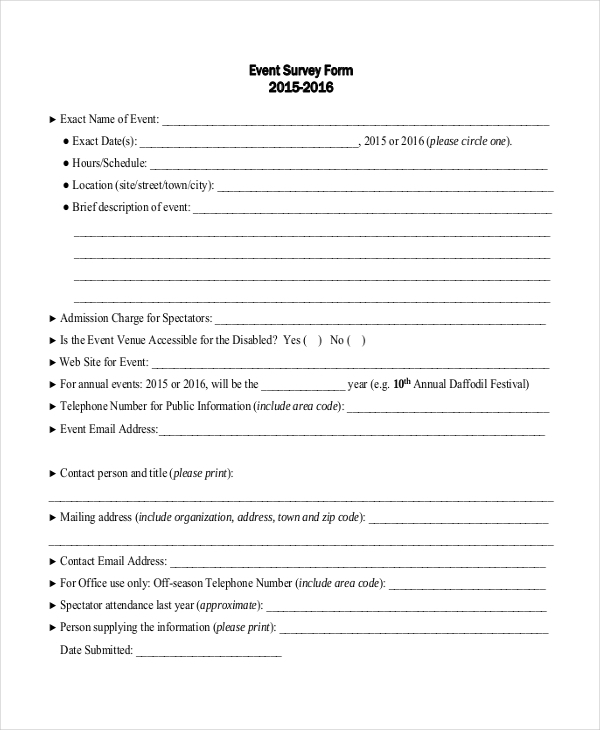 This event request form presents sponsor name, department name, contact person, phone, cell number, email id, co-sponsor name, contact person, event description, location, event date, start and end time, number of persons affiliated, advertisement details, admission charges and other facilities or service required details. 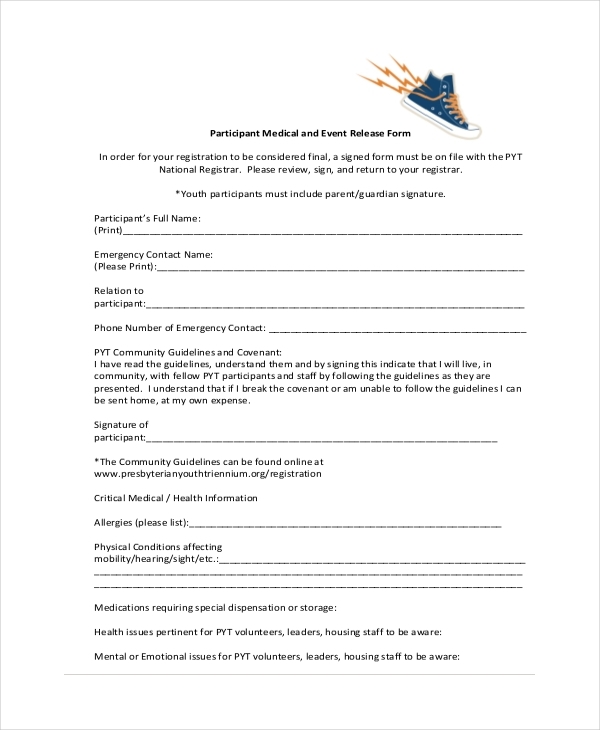 This event release form presents participant’s name, emergency contact number, relation to participant, phone number of emergency contact, health information, physician name, location, name of insurer, medical insurance policy number. The signature of the intent as well as parent is obtained. 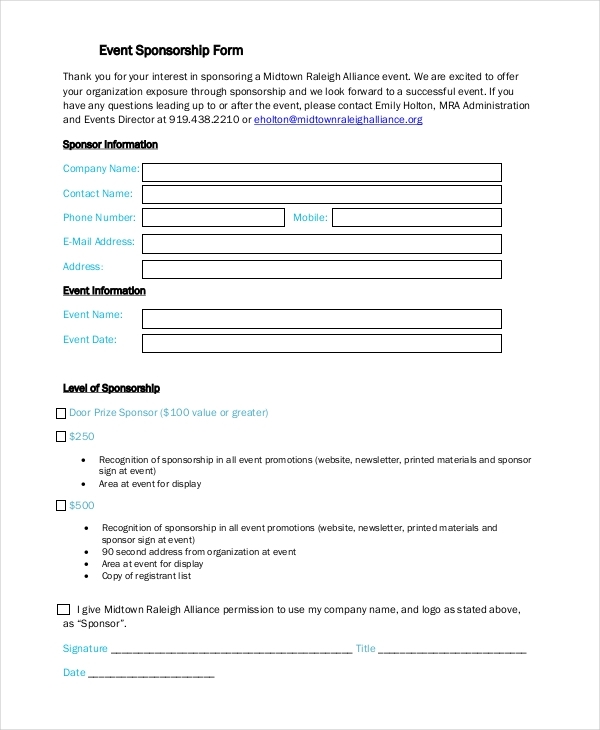 This event sponsorship form presents company name, contact name, phone number, mobile, email id, address and event information like event name and date. The sponsorship details are mentioned along with its price and signature of the sponsorship person is obtained. This event survey form presents name of the event, date, schedule, location, description of event, admission charge for spectators, website, telephone number, mailing address, event email id, contact person with title, contact email id and approximate spectator attendance as well as submission date. This event booking form presents name of the event, date, number of attendees, event start and end time, function room, set up, equipment details like projector, screen, laptop, microphone, whiteboard, flipchart, etc. It also mentions company name, postal address and delivery address. 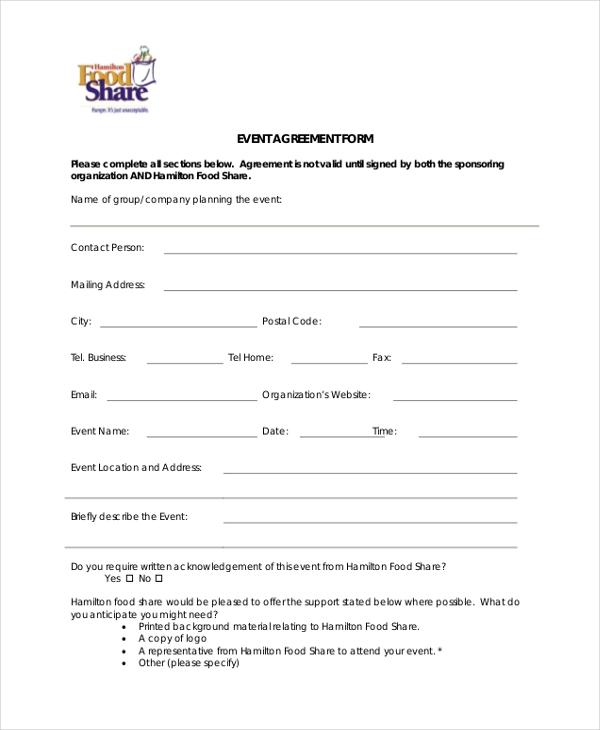 This event agreement form presents company name, contact person, mailing address, city, postal code, contact information, email id, website, event name, date and time, event location and address and description of the event. It obtains the signature from authorized person of the organization. 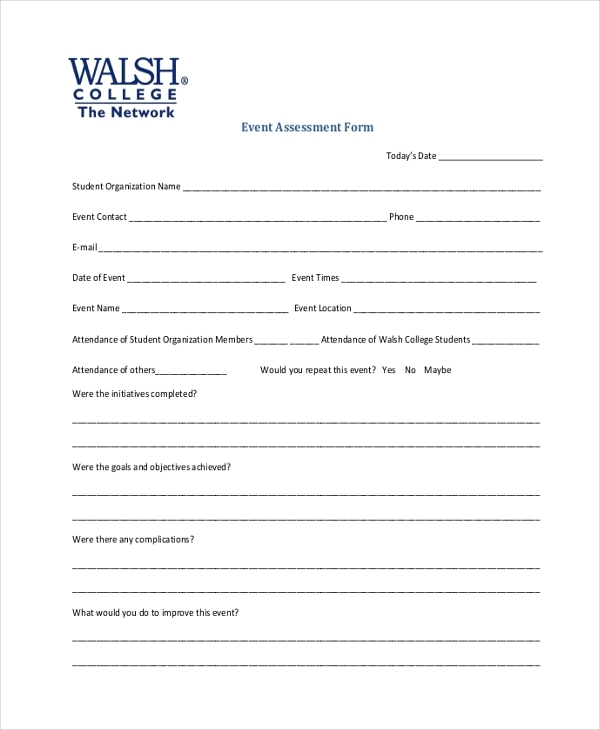 This event assessment form presents student organization name, event contact, phone number, email id, date of event, event time, event name, location, attendance of organization members, college students and others. It seeks feedback like achievement of goals and objectives, improvement suggestions and initiative. 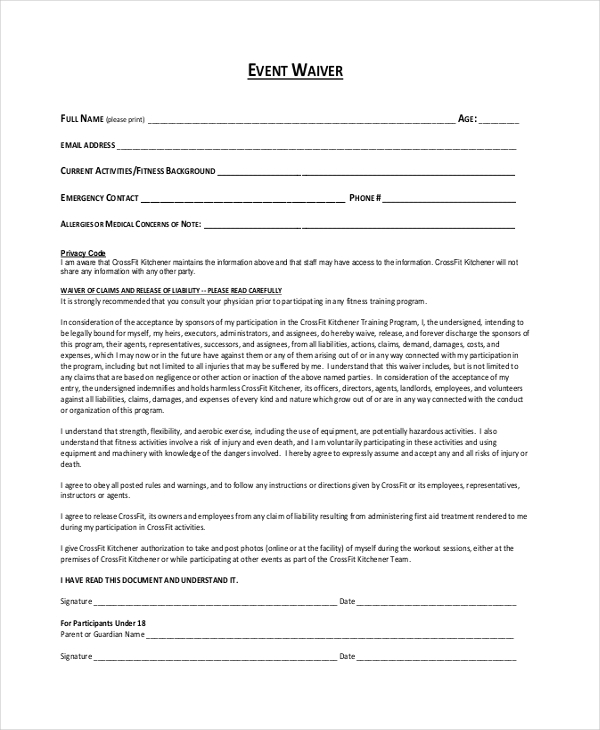 This event waiver form presents full name, age, email id, current activities, emergency contact, phone number, emergency contact and phone number, allergy details. It provides complete details about claims for waiver and obtains the signature of the authorization person and parent. This event submission form presents advocate name, member id, phone number, email id. It also mentions event submission checklist like booth diagram, the image of the banner, proof paid space and event information date of the event, name of the event, location, and type of event. 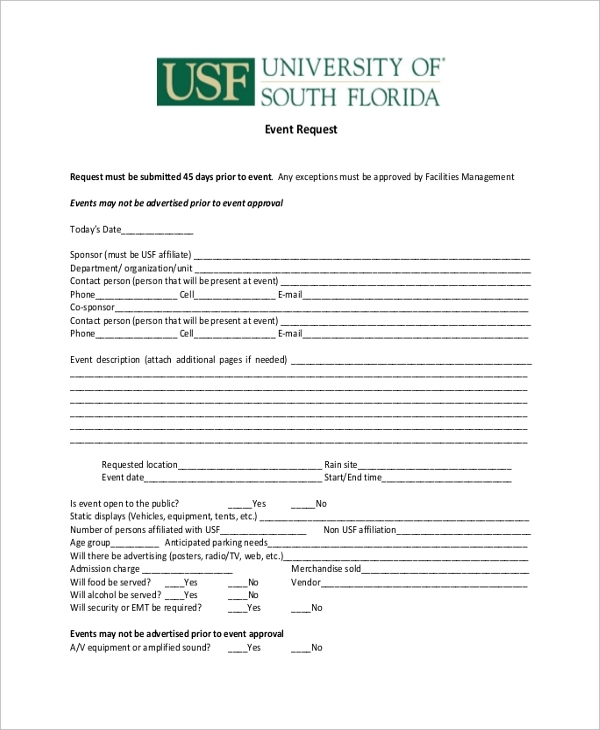 What are the varieties of event forms? 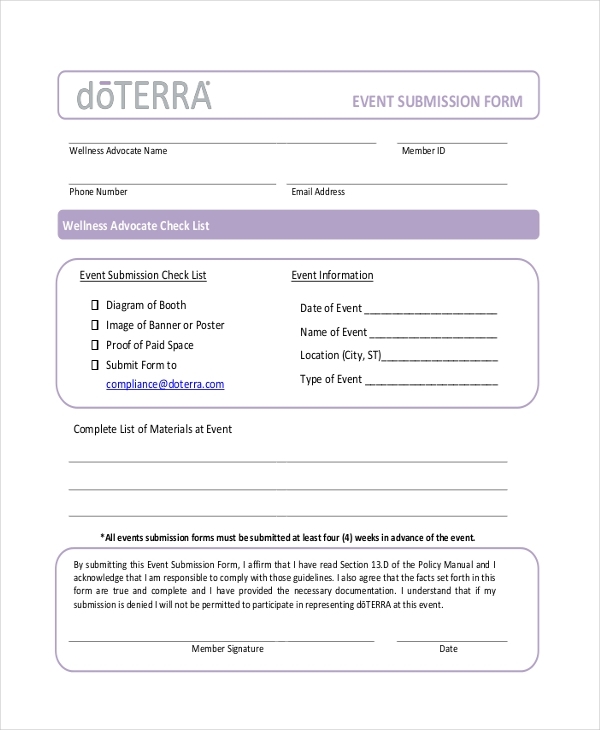 What are The Benefits of Event Forms? 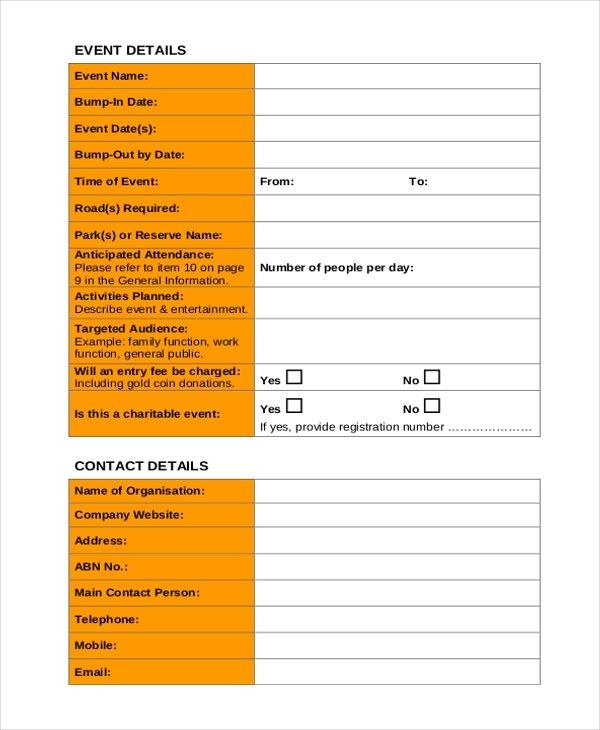 Event forms are extensively used by a variety of organizations to conduct various events with ease. They help in providing the requirements exactly and help to book accommodation, catering services, meeting hall requirements and seating arrangements. They help in knowing cost estimate for the event and organizations can decide on their choices. They provide complete information about activities and arrangements required. They enable the sponsors to provide sponsorship for the events smoothly. They help the organizations to plan the events and request cost details as well as register the events. They are easily downloadable and customizable as well as come in printer friendly format. 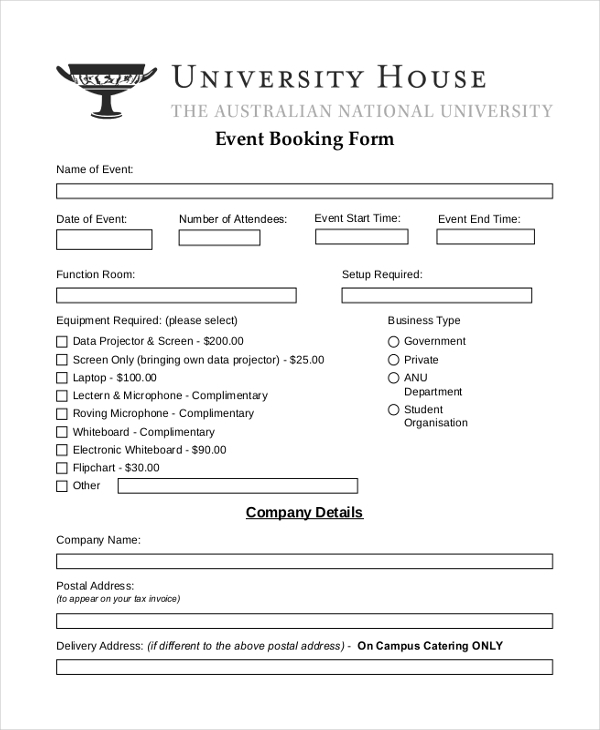 There are tons of event form templates available and one can utilize them for their requirements. They help in conducting events with high efficiency and enable to execute events by planning well. They are extremely dependable forms for any type of organization. One can go through event form sample by searching Google and get more information about them.